Make entertaining easy and set up a DIY Dessert S’mores Station at your next gathering! The crackling of burning wood, the crunching of the leaves and the cool nighttime air all mean fall is in full force. There is something fascinating about a fire. Especially an outside fire on a cool evening with friends sipping on cocktails gathered around. 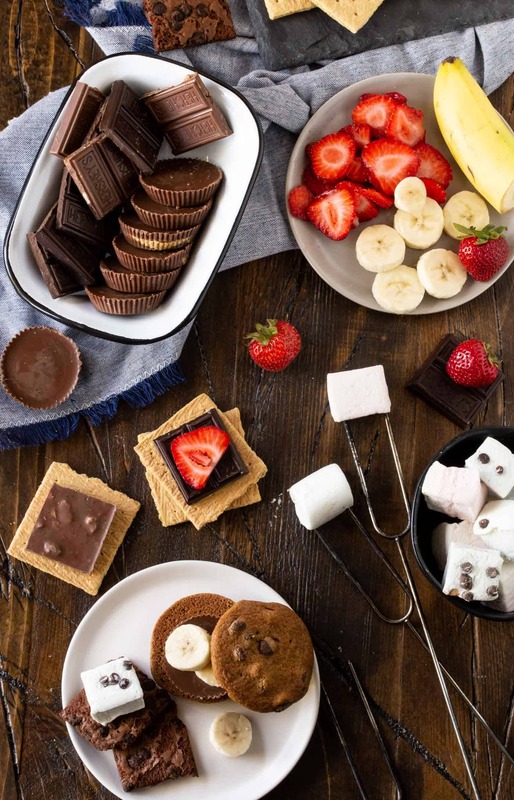 What better way to kick back and soak it all in than with a DIY Dessert S’mores Station? S’mores don’t have to be boring! The sky is the limit with the flavor combination possibilities. Set up a DIY Dessert S’mores Station and let your guests get creative. The best part of the night is you don’t have to wait on anyone. 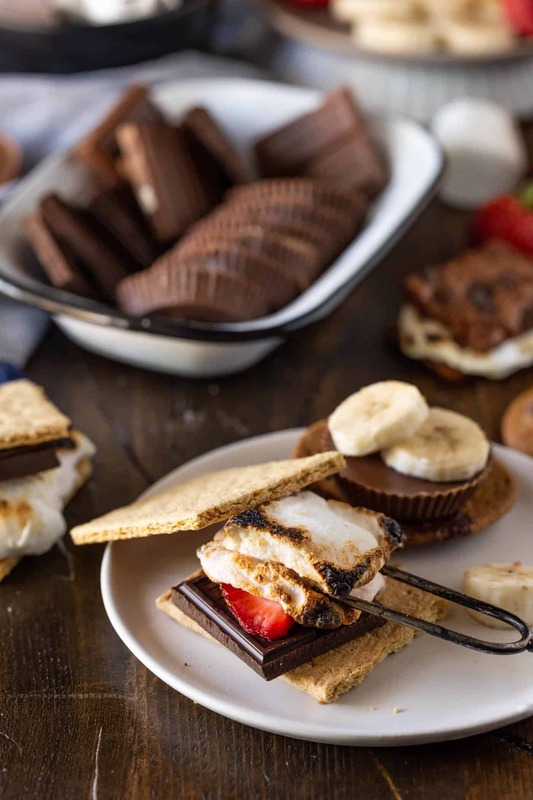 Here are some tips to make the best S’mores bar you have ever seen. What kind of marshmallows do I use for the s’mores bar? There are more than just plain marshmallows out there! We found some fun flavored marshmallows to add to the mix like mint chocolate chip, strawberry and birthday cake flavors! And don’t forget the roasting sticks. These color-coded long-handled sticks are some of our favorites. The colors are an easy way to let guests keep track of their sticks. Think outside the box: Add fruit to your s’mores dessert station. What? You want me to add fruit to my chocolate? We sure do! Banana slices taste amazing with a peanut butter cup. And you can never go wrong with fresh strawberry slices and chocolate. Adding fruit is just a bit of an unexpected but tasty twist to your classic s’mores recipe. What kind of cookies and crackers do I use for a DIY S’mores Dessert Station? The sky is the limit! We used chocolate chip cookies, Brownie Brittle, chocolate graham crackers and regular grahams for the traditionalist. But don’t forget: salty and sweet are always a winning combination. Add some butter crackers like Ritz to the sweets tray and let people go to town. 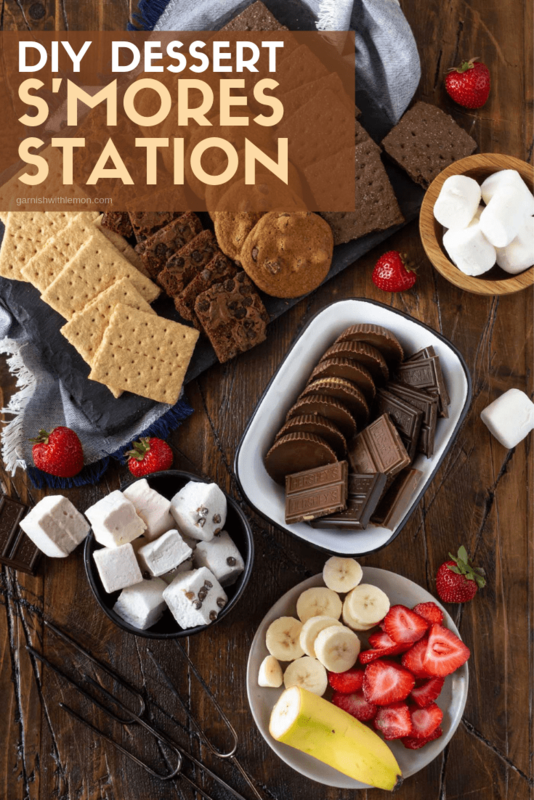 What is the best chocolate for a s’mores station? Get creative with your chocolate choices! There’s more to s’mores than just milk chocolate. We love chocolate and peanut butter so we included some peanut butter cups, some dark chocolate covered caramels, toffee and both dark and milk chocolate. But don’t stop there. Add your favorites to the mix. You can’t go wrong. No matter what the occasion for the gathering, a DIY Dessert S’mores Station and a bonfire are always a happy ending. Make entertaining easy and let your guests do the work with this easy DIY Dessert S'mores Station. Set marshmallows in bowls and arrange cookies and graham crackers on a tray. Set chocolate in a bowl. Slice strawberries and bananas and place on plates. Roast Marshmallows and build your own s'mores. I love this idea. I wish I’d thought of it myself! It’s great for parents and kids! I’m going to try this next time we have friends over and we’re all together. It will keep the kids busy too!